As a business owner, keeping your customers’ information safe should be a top priority. With so many customers depending on your website for purchasing and communicating, it falls on you to keep all of that data secure. Google has made it their mission to secure the web, and their most recent announcement reflects that commitment. Speculation has increased over the last few years about Google’s SSL certificate requirement warnings. Google has advocated website security through HTTPS encryption, and urged users away from unencrypted sites, but now they are rolling out a new enforcement with the most recent release of Chrome. If you are still using HTTP, the data you are transferring is not secure and could be intercepted. Now, Google has decided to warn users when they access an HTTP website. There are a lot of factors that go into understanding these changes and implementing them on your website, but don’t worry; we have answers to your biggest questions about HTTPS encryption. Imagine a tube running between your computer and your customer’s computer. All your customer’s personal data and communication with you runs through this tube. Using HTTPS encryption adds a stronger layer around that tube, making it harder for someone to break in and steal the data. Without HTTPS encryption, someone else could redirect the user to a malicious site, impersonate your business, and steal your users’ information. Obviously, you want to keep your customers’ information and communication safe, which means you need to fix your SSL certificate. What Kind of Warning Is Google Going to Implement? When the new Google Chrome 68 releases in July, all websites using HTTP will have a “not secure” warning in Chrome. It will appear in the omnibox, or URL bar, where the web address shows up. This will be a big red flag to your potential customers, likely scaring them away from your site. I Am Already Using HTTPS, So I’m Fine—Right? 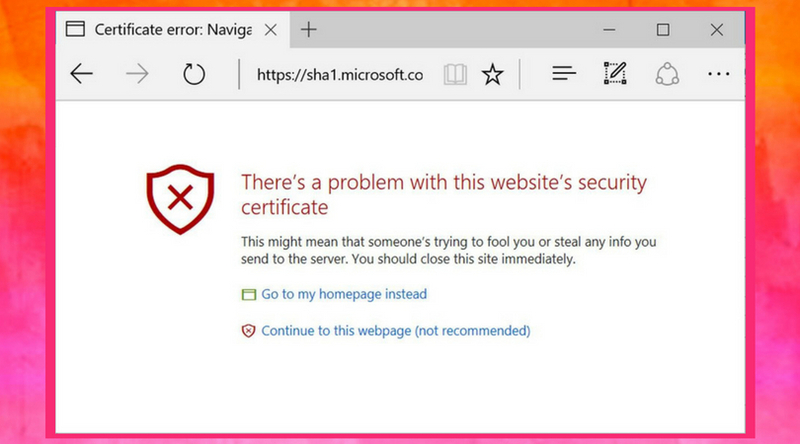 Even if you are already using an HTTPS connection, your site might still have mixed content that is putting you at risk of getting that “not secure” warning in Chrome. Mixed content occurs when the initial site is loaded over HTTPS encryption, but other resources—such as images— are loaded over an insecure HTTP connection. This severely weakens the security of your site. As of 2017 Chrome is the most popular web browser by far. When it comes to browser use, Chrome has a 44.5% market share. To put that into perspective, Safari comes in second with just 25.4%. The numbers tell us that many, maybe even most, of your customers will be accessing your website on Chrome; this means they will see the “not secure” warning if you don’t meet Google’s SSL certificate requirement by July. How Can I Be Ready by July 1st? Take action now to ensure your website is working securely and protecting your users’ information. For as low as $150* we can correctly implement an SSL certificate and check your site for any mixed content that might trigger a warning. Invest in your website’s security and avoid the “not secure” warning in Chrome that might scare your customers away. Contact us today and let us help get your website safe and secure!